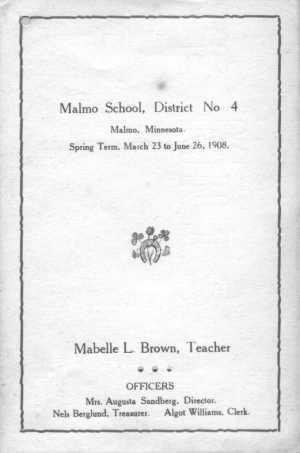 "Malmo Township, Aitkin County, Minnesota"
The following Souvenier booklet was sent by Randy Wall. Spring Term, March 23 to June 26, 1908. This is the genealogy of Algot Williams listed as clerk above. His grandson was married to my sister. 1. IDA CHARLOTTE 1 BJORKLUND was born May 17, 1863 in Varnland State, Sweden, and died November 29, 1915. She married ALGOT WILHELM WILLIAMS 1 April 29, 1882. He was born December 28, 1858 in Vasta Jõtland, Sweden, and died October 07, 1937.
i. ELLEN WILHELMINA 2 WILLIAMS 2, b. January 08, 1883; m. LINDLEY LEONARD MARCUM; b. August 06, 1879, Dayton, Ohio. ii. OSCAR WILHELM ALVIN WILLIAMS 3, b. April 24, 1885, Vasta Jõtland, Sweden; m. JOSEPHINE LUCILLE SLETTON; b. September 24, 1892.
iii. CARL GUSTAF WILLIAMS 4, b. 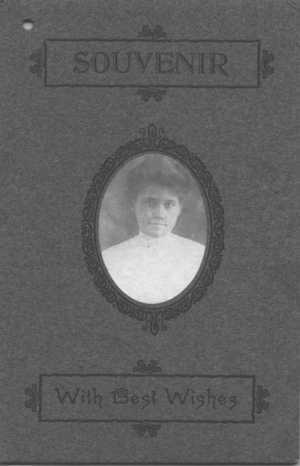 May 02, 1888; m. MINNIE AMELIA DOERING; b. November 11, 1918, Olivia, Minnesota. iv. AXEL SIMON WILLIAMS 5, b. October 28, 1891; m. RUTH AMELIA GROEHLER; b. July 18, 1896, Superior, Wisconsin. v. GUNNAR ELIAS WILLIAMS, b. April 17, 1894; m. CAROLYN MATILDA LILGINQUIST 6; b. March 15, 1897.
vi. ANNA ELIZABETH WILLIAMS, b. February 21, 1897; m. ARTHUR HORACE OLSON 7; b. September 29, 1893.
vii. SIGNE MARIE WILLIAMS, b. July 15, 1899; m. CARL ALFRED OLSON 8; b. April 08, 1893.
viii. PHILLIP EDWARD WILLIAMS, b. September 06, 1902, Malmo, Minnesota. ix. ALFRED EMIL WILLIAMS, b. June 25, 1904, Malmo, Minnesota; d. December 15, 1905. Your web page is great! The Malmo Souvenir Booklet is very interesting! 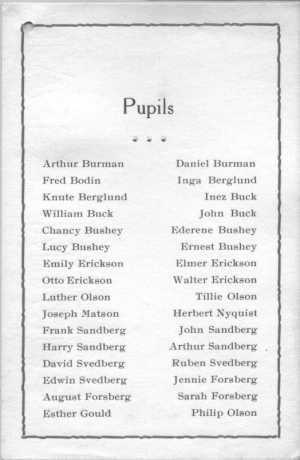 It lists My grandfather and his siblings. Philip Olson, Luther Olson, and Tillie Olson. I don't know much about this family, and every bit helps.